Practitioner Quality Bowls are the original bowls hand made by master Himalayan craftsman throughout antiquity. Today's market is flooded with counterfit imposters, or mass produced replica's which should not be confused with the originals. Are you looking for Malla Dynasty pieces, or bowls made from their next generation ancestors? You should be, if you are serious about obtaining genuine singing bowls, which contain the alchemical lineage handed down from Father to Son. Don't be fooled by so called experts, or by online shops passing off fakes. Why not deal with someone who is regarded by Nepalese and Tibetan sources as the most knowledgeable person on this subject? Why not deal with someone who has actually lived and studied in the Himalayas, and has lectured and taught singing bowls to thousands worldwide? You cannot select Practitioner Quality Bowls through photos, internet sound files, or other well thought out gimmicks. Why? Because sound files are deceiving, the quality or accuracy of the file depends on many factors including what type of striking implement was used and the type of microphone. Genuine Singing Bowls are multi harmonic instruments that can contain more than 10 harmonic intervals.The best way is to actually play it in your hand. Would you buy a car without a test drive? If you are not prepared to do this because you feel or think there is a better way, then go no farther on this webpage, I suggest you let Google do your buying for you. I offer a service that is unmatched by any other business dealing in Singing Bowls. Practitioner Quality bowls are getting almost impossible to find, and prices are starting to soar in the West. You have no idea how many 'serious' Singing Bowl collector's say to me, " I wish I had talked to you first". Let me include you in a little secret; wholesale buyers and sellers of Singing Bowls worldwide buy their inventory in Nepal by the kilo weight, and then assign a retail price to it. Nearly 98% of what they purchase either knowingly or unknowingly is C or B stock; they are rarely ever shown A or AA ( 1 percent bowls ) stock. How do I know this? Because I know all the main reputable dealers, and they have told me this. Very seldom does a wholesale dealer want to pay retail prices in Nepal, when he can buy a B stock bowl, and tell you it's AA; how are you going to know? For example: If you look at the new singing bowls that have etchings on them, either on eBay or in the various online stores; those bowls are currently being sold for $18 per kilo weight wholesale in Kathmandu. Thats roughly about $8-$9 per bowl, I rate those etched bowls at C or D quality. Basically they are junk compared to the original antique bowls. The majority of Singing Bowls that are currently being sold on eBay are actually made in India, the Chinese have even started making them, and now the Islamic community in Kathmandu has started making them. Just because a Singing Bowl has a sticker on it saying it was made in Nepal, does not mean it actually was. Those 'Made in Nepal' stickers have to do with export laws, and have no bearing on where it was truly manufactured. Another series issue for buyers, is dating. The majority of Singing Bowls sold on eBay and other internet stores are really just 21st and 20th century stock. Even the internet suppliers who think their selling old antiques, are actually selling just 20th century, and some 19th century stock. When a bowl is advertised as 18th or below, that makes it Malla Period, and those bowls are not Malla Period, I can tell you with confidence that they are not. The largest eBay sellers are so full of themselves, it's ridiculous. Because the current economic situation in Nepal is so bad right now, most Kathmandu Valley craftsman have closed their factories. The shops are bringing in even more bowls from India than ever before. Where do I obtain my Singing Bowls? For one, I brought so many bowls back from Nepal in the 1970's, I have not exhausted that inventory. I also imported throughout the 80's and 90's before all the old voices dried up. I also buy collections from early western collectors as well as Nepalese and Indian collectors. I also obtain personal pieces from the oldest Singing Bowl families in Kathmandu. Why is this important? 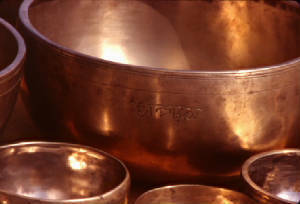 Most Singing Bowls made in the 20th century to now, contain a totally different type of bronze. This bronze DOES NOT contain the most resonant type of copper, nor does it contain silver. Bowls made today, are made from industrial grade copper and tin, cheap, and not made for sound quality, that's why new Singing Bowls are very thick. If you notice, antique bowls were made at times, paper thin. I am one of the few westerners who has studied the alloys of ancient Bactria, Jain Period India, and Malla Period Nepal, as well as Tibet and China. I also want to add one more important point about Singing Bowls that has created a bit of misunderstanding over the years. Singing Bowls ARE NOT made from a 7 Planetary alloy that is eluded to in books, internet websites, and even sellers. This is myth. Singing Bowls are made of a bronze alloy known as bell metal. The so called 7 Planetary alloy is not resonant at all. How come the so called experts don't know this? It's because their just shopkeepers intent on profit and not accurate history or helping a dedicated student or collector. If a internet store mentions this false alloy information, it's a testament that they have no idea what they are selling. So why would you trust them? Click Here for Practitioner Quality Singing Bowls. Tell me what you want, and how you plan on using it.